If you have not seen the film "La La Land", do yourself a favor and watch it right now. Go buy it, rent it, Redbox it, whatever you have to do to get that movie projecting to your eyeballs. I was always very interested in the movie, as a huge fan of musicals and the Hollywood culture and the legendary Ryan Gosling, it seemed to be right up my alley. For some reason I just never got into a theater to see it, and following the Academy Awards my hype was at an all time high. Still however, La La Land evaded me. Finally a couple weeks ago it was released on Blu-Ray and I finally got to sit down and watch it with my girlfriend. My initial impressions was that it was a fantastic, fun, and emotional movie, but it didn't blow me away. It wasn't until just 48 hours later that I started to listening to the soundtrack that I really fell in love with the film. Almost a week later, both my girlfriend and I cannot stop talking, listening, and thinking about it. I believe it to be one of the best films made recently, and definitely one of my all time favorites. With all of that said, let's dive in. 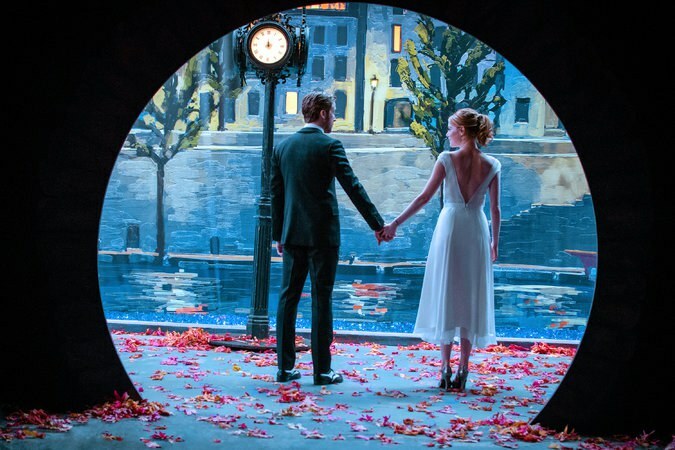 I'm not sure why, but after my initial viewing of La La Land, it felt like something was missing, like one tiny gear in the colossal machine that is the film was not quite turning. I couldn't quite put my finger on it, was I expecting something that didn't happen? Did the ending turn me off? Was it over hyped? I wasn't prepared to surrender. The next day I popped the soundtrack on Spotify and gave it a listen, then again the next day, and the next. Suddenly I obsessed with it. I don't think a day has gone by where I haven't listened to the whole thing at least once. Not only is the music beautifully crafted by Justin Hurwtiz, but it adds so much to the movie. From the traditional musical songs like "Another Day of Sun" and "Someone in the Crowd" to the witty back and forth of "A Lovely Night" to John Legend's "Start a Fire" it's all so diverse and so good. The subtle piano cues and theme's played all throughout the soundtrack have emotional weight to them, so much so that I refuse to listen to one song because it's ending actually makes me sad. 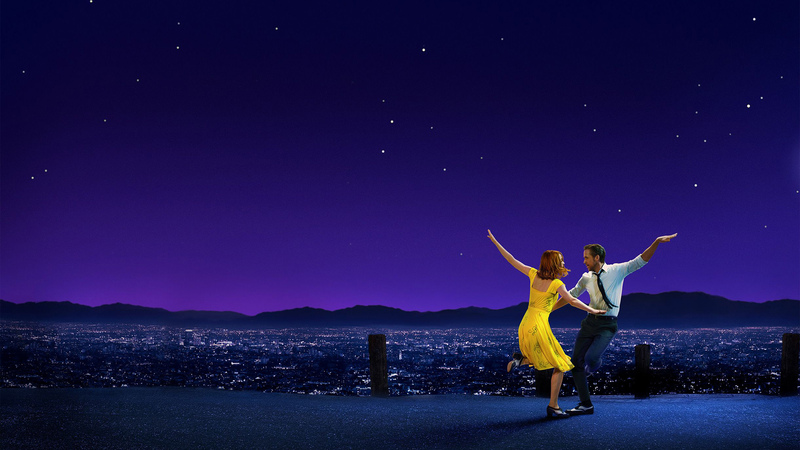 Once you've experience the movie, the music corresponds so well and the more you listen to it the more you understand and fully enjoy everything La La Land has to offer. I gotta say, I wasn't sure how this combo was going to work out. 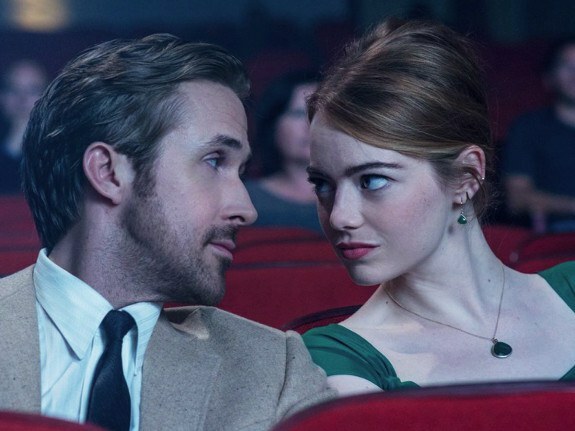 I don't think I've ever actually seen Ryan Gosling smile ever in a movie before, and I didn't know if Emma Stone would have the singing chops for a big budget Hollywood musical movie. Boy did they shut me the hell up. The pair work so incredibly well together they pull you right into the movie. And while neither are going to win a Grammy for their vocal work, their singing feels entirely natural for their characters and it in no way is bad. It's more about their performance and what they're saying than how impressive their vocals are. If you don't fall in love with these characters, you have no heart. Also, extra shout out to the Gos for learning how to play improv jazz piano (to a frighteningly impressive degree) and tap dance. I legitimately wonder if there is anything Ryan Gosling can't do. I honestly really didn't know what La La Land was about, I knew it had the Gos and Stone and they fell in love and there was music and that's about it. It obviously turns out to be much more than that (and not in a way), but halfway through the movie out of nowhere John Legend shows up as 'Keith.' He's from a band Sebastian (Gosling's character) used to play with and he wants him to come back and play. I don't want to spoil much here, but at one point we see the band on stage while on tour and they play an entirely original jazz-pop song co-written by Hurwitz and Legend. The song (Start a Fire) is actually pretty great and very catchy and it could totally be a pop hit outside of the movie (it actually hit #1 in the UK charts when the soundtrack was released). It was a very awesome surprise and if you're a fan of Legend at all you should check him out in this movie. 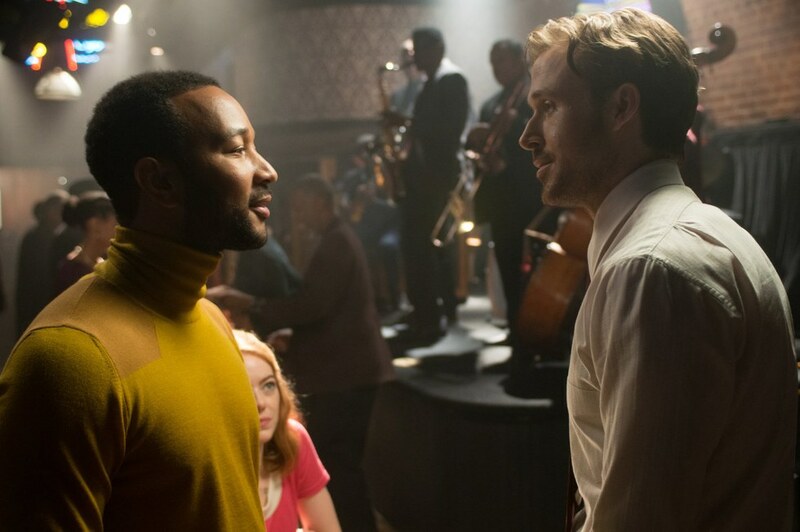 Gosling's character Sebastian is a man set on bringing back traditional jazz in to today's music scene. His dream is to open his own Jazz Club just like they used to be back in the old days. 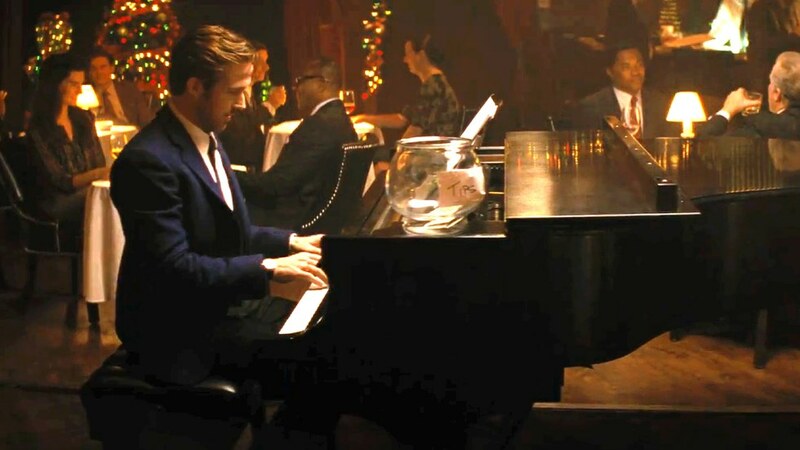 So obviously there's lots of Jazz to be heard throughout the movie, whether it's scenes in a club, Sebastian's improv piano playing, or the movie's soundtrack (try listening to the Summer Montage song and NOT want to dance around outside in the sun). With today's radio inundated with crappy pop hits that all sound exactly the same, it's incredibly refreshing to hear a whole genre of music that seems to be mostly lost to history to younger generations. I don't want to spoil the ending here, because I imagine some people reading haven't seen the movie. I'll probably pen something up on the actual story of La La Land later, but the ending left a profound effect on me. At first you might feel a little betrayed by it, but the more you think about it, and the more you understand the movie and the characters you eventually come around to know the ending was the most perfect way that movie could have ended. Just thinking about it makes me emotional. I'm gonna stop there, because you need to experience it on your own. Well that's all I got. If you have any inkling of interest you NEED to do yourself a service a watch this movie. It's such a refreshing change of pace from the horde of superhero and action movies coming out today, and you won't regret it. Excuse me while I go listen to it some more.